Back into the cooking vibe again after a month long holiday in New Zealand, in my kitchen I have souvenirs, memorabilia of my time revelling in fresh organic food, good cooking (by others), fine wines and great coffee amongst some of the friendliest and most easy going people on this planet. Tea towels are my go to kitchen souvenir when I travel. They are light weight and take minimal space in already bulging luggage. Gone are the days of ugly tea towel graphics and gaudy colours printed on poor quality fabrics, now it’s possible to choose top quality cloths with attractive designs in subdued tones. Using my souvenir tea towels will remind me to stop and reflect on my wonderful visit to NZ. Photo props are never far from a bloggers mind. For ages I’ve been thinking about a toast stand and the many uses it would have as a background prop. I found this little cutie in a secondhand shop in Greytown. It’s a tad skewiff, but that just adds to it’s charm. Pau shell is quintessentially Kiwi, as is the timber of the kauri tree. We were cursing our luck at encountering an humungous cruise ship and all the passengers that issued forth from it while we were in the Bay of Islands. It turned out to be a blessing in disguise. The local enterprising craftspeople ran a market on such days and that’s where I found this magnificent serving board, a slab of ancient swamp kauri inlaid with resin coated pau. I got a bit edgy about losing my board after declaring it to quarantine upon our return but thankfully they didn’t bat an eyelid. Rachel from Rachel’s Kitchen NZ recommended we visit Black Barn Winery. Not only is it a great winery but a foodie hub as well. An avenue of fruiting fig trees leads to the tasting room. We discovered a well stocked kitchen shop at the opposite end as we turned to leave. 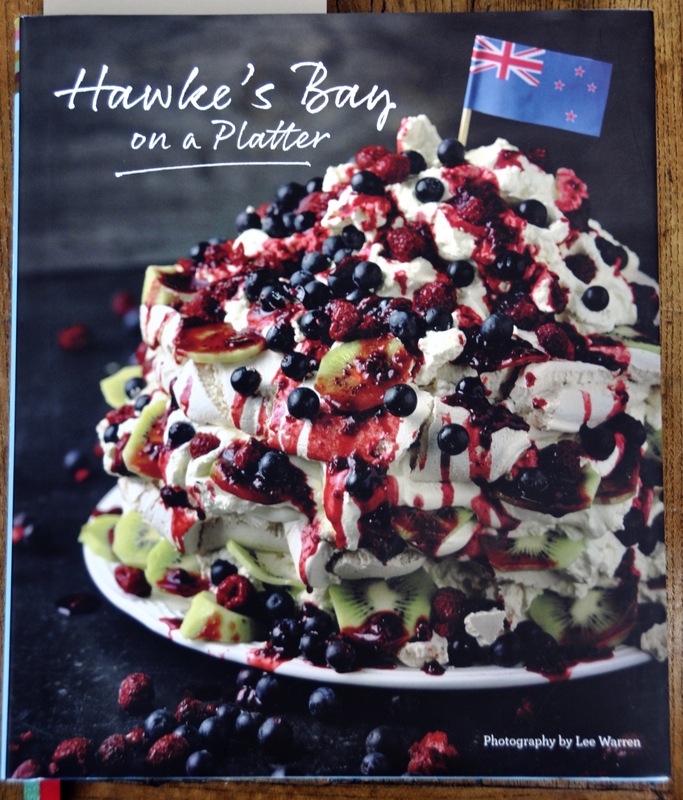 I couldn’t resist buying a copy of “Hawkes Bay On A Platter.” Compiled to raise funds for two local private schools this classy publication encompasses all that is good about what we encountered in the region, fresh, local, organic and seasonal. Standby for wintery venison, port and rosemary pies…. And on my kitchen bench is a list of the dishes and ingredients I feel inspired to cook from a month of foodie exploration and eating out three meals a day. The ever generous Celia hosts the monthly IMK series at Fig Jam and Lime Cordial. Happy belated birthday Celia, you sweet young thing! 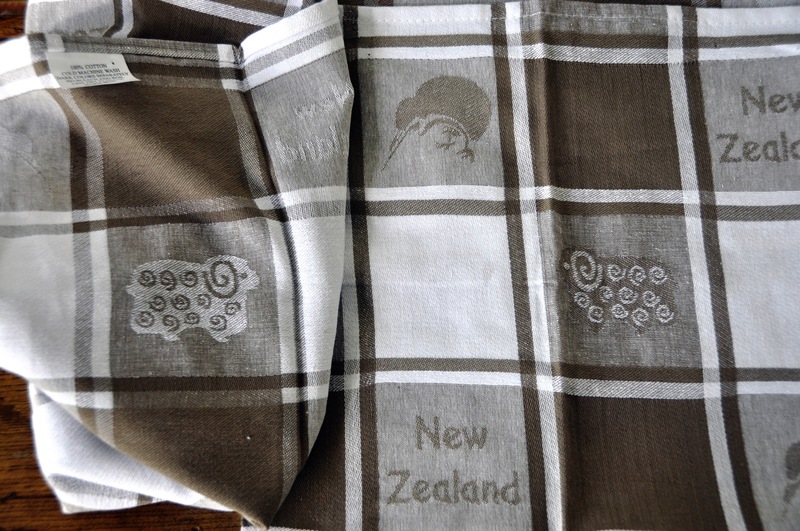 I have a very similar checked tea towel from New Zealand, full of kiwis and other NZ themes! It’s one of my favorites! Your toast rack is charming, I love that it is a bit off tilter, all the more interesting. And tea towels, you can never have enough can you? It’s lovely to have something that you use every day remind you of places you have visited. I can’t wait to see your pictures using the serving board, magnificent is a good descripton! Thanks Liz. I love having holiday memorabilia to use everyday. I’ve used the board a couple of times. I really love it’s organic shape. I’ll use it as a photo prop some time soon! Thanks Beck, you could use your treasured tea towels as photo props. we love NZ. they have such great souvenirs too. love the tea towel and the kauri board with the paua inlay. so pretty. that cookbook looks marvellous. i just checked it up- i am debating ordering it online but it is quite pricey to Australia. eek! That serving board is truly a think of beauty! Stunning. I like to find unique pieces on my travels, I hit the jackpot this time! Oh No, I saw that beautiful board at the craft market in the bay of islands and hummed and ahhed and didn’t get it- damn, it is so gorgeous. Love that little styling prop- the toast rack too. My first reaction to the pao inlay was too much bling for me, but I then the more I looked, the more I loved it, the shape especially. Served a ploughman’s lunch on it the other day, it looked a million dollars. I have the makers contact details, you could always mail order! We stayed in Russell which was gorgeous, especially after all the day trippers left, but Pihia was very commercial. We drove to Russell along the old coast road, it was gorgeous! Thanks for stopping by my blog! You have some lovely souvenirs, so nice. I love the drawing at the top of your blog, very cute. This is the second set of tea towels in the April IMK. I am thinking of getting myself new ones. And I agree with you with the props in blogger’s mind. That pavlova on the book looks incredible. I thought the NZ pavolvas were amazing and much better than our poor UK imitation. I always have to declare to Australian immigration that I live on a farm so they insist on checking all my footwear for any speck of dirt. My cleaning obviously isn’t to Australian standards as I once had a pair taken away that came back sparkling clean and washed. I wish UK border controls had such standards. But Anne, I’m not sure how you would cut and serve that pav without making an enormous mess! True! But who cares if it tastes as good as it looks. Whitebait fritters, let me know when you make those, I may have to visit! That pavlova looks amazing and i love the little toast rack, so sweet! I love your toast rack. I keep collecting things for “props” too and am fast running out of space. That pav on the cover of the book is amazing. A lovely peek into your kitchen, thank you. It’s a pleasure Vicki. I think a photo prop library would be a good idea…..
My life is run by photo props and I’m sure most of us food bloggers feel the same. I love your Toast holder? The mroe skewwhiff the better. Looks like you we truly inspired by your travels. Can’t wait to see everything you make on that list! I love learning about new ingredients and new dishes when I travel, they are best souveniers of all.. Thanks Anne, it is a beauty, I bought it directly from the craftsman. He fossicks for the ancient swamp kauri, his wife collects the pau. I love the organic shape of the board…. Sandra, I totally agree about tea towels. So many snappy designs that are a pleasure to show off, either in the kitchen, or creatively styled (just so) as a photo prop! We honeymooned in NZ and yep, I bought a vibrant pop art style one covered in kiwi birds, love it. Yep, something solid has hit the toast stand hard. I used my new tea towels to protect it in my lugguge..
Rest assured Fae, your post arrived in my reader, though quite a few hours after your comment. Yet to catch up with my reading. Can I come and eat that menu? Sounds like you had an amazing trip. My cousin lives in NZ and I really should start plotting. That toast rack is beautiful and the grain on that beautiful board. Always a pleasure to see what’s in your kitchen. Amazingly beautiful scenery and a fantastic food/wine/coffee culture and super friendly people are good reasons to visit NZ. 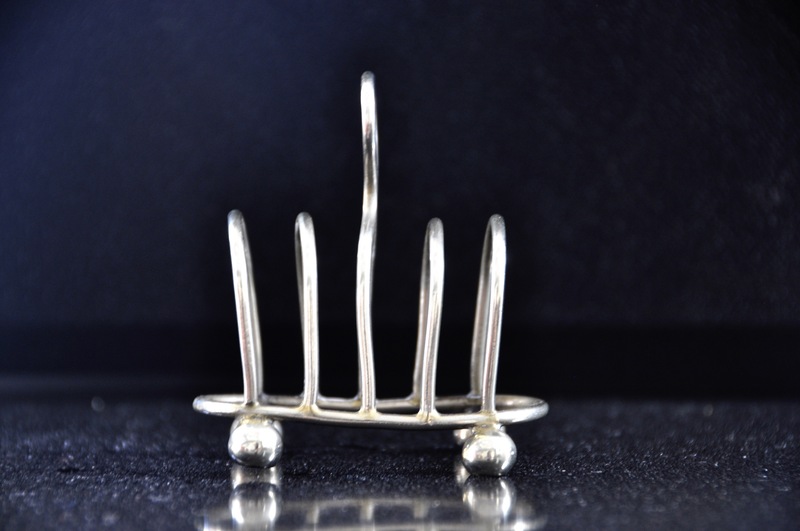 We loved NZ Lizzie, the jaunty angle of the toast rack keeps catching my eye….. I like your memorabilia, it sounds that you had a good time in New Zealand. Your pics are just great. Thanks for sharing and have fun with the NZ cookbook! I am peagreen with envy about your serving board also of course: what a beauty! I usually very much agree with our quarantee laws: methinks the country of origin does play a part and I always have had all the doubtful items on top of the case and offered to show! The officers have invariably been courteous and altho’ I brought ‘doubtfuls’ in from Malaysia, Thailand et al, I was always allowed to keep them after inspection. One nifty way if in doubt is to phone up the Consulate: in KL I was even asked to come to the Consulate for ‘show and tell’ and was given a ‘letter of approval ‘ by the office staff . . . and now, Happy Easter!! It’s always fun to see what’s in your kitchen. 🙂 I really like your toast stand. Good find! Glad you enjoyed Black Barn – Sandra – and pick yourself up a copy of Hawke’s Bay on a Platter, it has proved to be an excellent fundraiser for the schools – Woodford House (my old school) and Hereworth (a boy’s prep school that my brothers attended) – not sure what reprint they are now up to – enjoy. Rachel we had a truly wonderful time in Hawkes Bay. Thank you for all the recommendations. Black Barn is impressive! I bought the cookbook without realizing it was a school fundraiser. It’s a beautiful publication! I love your toast stand! It’s cute and sleek at the same time. Sometimes you can really find little treasures in secondhand stores. Thanks Francesca, if only secondhand treasures could talk..
Oh Mrs Recipe, you are making this NZ born chicks heart just sing. 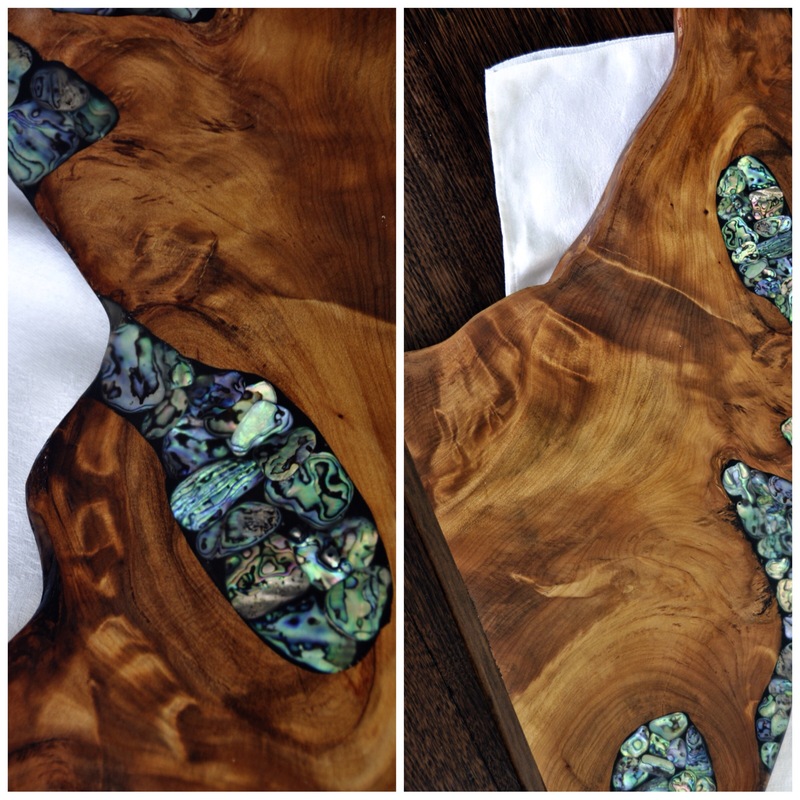 That paua shell cutting board is just gorgeoous and the toast rack? Love! As for the feijoas and tamarillos….can’t wait to see what you do. Tamarillos are one of my mums fave fruity vegetables ever. One of my uncles make the best whitebait fritters I have ever tasted but I have yet to ask for the recipe! Bet yours will be ace. My Dad had a tamarillo tree when I was a kidand I’d forgotten their existence until I spied them in NZ. I love them poached, but they make delicious jam too. The feijoas on the other hand will be a new experience. I was thinking “how did she get that past customs’ when I saw your board. I’m so glad they didn’t confiscate it – although I have to admit I wouldn’t have told them just in case!!! It’s just stunning. I’m looking forward to seeing your fennel & pork pizza. I declare everything to customs Nancy,better than being caught red handed. Just once, they seized some cloves I was bringing in from India. After they’ve satisfied themselves that the wood is not infested, they let it through. 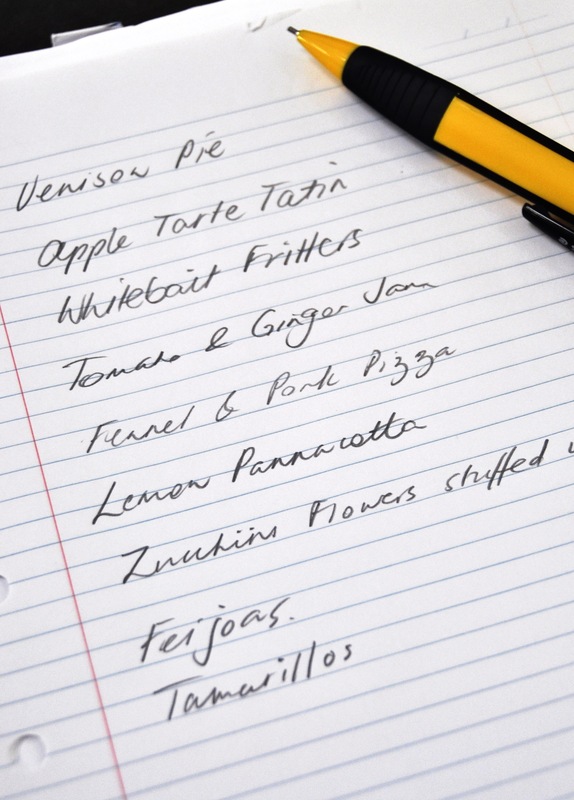 I notice the apple tart tatin on your list! Absolutely love the cutting board with the inlaid pau shell. Really beautiful iridescent colours. And, those cute little sheep on the tea towels are fab. Although, I do have a thing for kitsch tea towels. A great find with the toast rack. Oh I have my fair share of kitsch tea towels too, but it’s nice to have the choice of a more aesthetically pleasing design. Yes, the apple tart tatin was the top of the list! Good to have you back, especially with a suitcase stuffed with lovely goodies. The wood in the kauri board is beautiful! All swirly and golden. How lucky it got through quarantine. I am looking forward to many delicious recipes from your new book. Thanks Ann, as soon as the quarantine official knew it was a food grade board there was no issue. Sandra …You had me at the tea towels and love Pau shells as used to live in New Zealand too! It’s a pleasure Joanne, so much about NZ to love! This entry was posted on April 2, 2015 by ladyredspecs in Food, In My Kitchen and tagged food, in my kitchen, New Zealand.